September 17, 2012 September 16, 2014 / Julie Brook, Esq. Sentencing across states in domestic violence cases sometimes seems almost random, or at least flawed. Famous cases of apparent sentencing favoritism, as with boxer Floyd Mayweather Jr’s lenient sentence in Las Vegas, can hurt the integrity of the system. But California has a domestic violence sentencing scheme that is not arbitrary; instead, it is aimed at fairness, with clear direction for judges. Uphold the legislative intent to treat domestic violence as a serious crime. 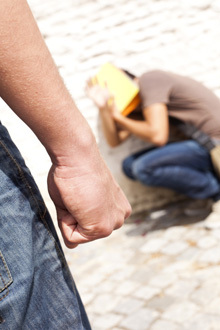 In California, a person convicted of battery (any battery, not necessarily those provisions that are domestic violence per se) in a domestic situation (defined by statute) is subject to obligatory conditions. Misdemeanor battery carries minimum sentences, required counseling, required fines, firearms prohibition, restraining orders, etc. Misdemeanor sentences can’t be enhanced. A conviction of felony battery also requires certain restrictions and requirements (e.g., restraining orders, counseling). Importantly, felony sentences for domestic violence can be enhanced. Cal Rules of Ct 4.421. Enhanced sentences are generally based on factors related to the crime or to the defendant. When the crime is particularly vicious and callous. Cal Rules of Ct 4.421(a). See e.g., People v Nevill (1985) 167 CA3d 198, 205 (defendant repeatedly fired semi-automatic rifle at his helpless wife at point-blank range in front of their 16-month-old child). When a weapon is used in the crime. See People v Burton (2006) 143 CA4th 447 (use of gloves with sharp edges qualifies as dangerous weapon under Pen C §12022(b)(1) for purpose of enhancing corporal injury and torture convictions). When the crime took planning or sophistication indicating premeditation. People v Kozel (1982) 133 CA3d 507, 517 (husband drove with pistol to estranged wife’s home, then her boyfriend’s home, reflecting planning). Defendants who take advantage of a position of trust or confidence to commit the domestic violence offense, or who attack a particularly vulnerable victim are subject to enhanced sentences. Cal Rules of Ct 4.421(a). Enhanced sentences are also imposed based on certain factors relating to the domestic violence defendant him or herself, such as the defendant engaging in violent conduct indicating serious danger to society or having prior convictions. Cal Rules of Ct 4.421(b). There are many things for the court to consider when imposing a sentence for domestic violence. For an excellent checklist of these considerations, check out CEB’s California Judges Benchbook: Domestic Violence Cases in Criminal Court, chap 7, the book that criminal court judges use. Apart from criminal penalties for domestic violence, there may be consequences in family court (e.g., protective orders, restrictions on custody or visitation, mandatory anger management classes), in juvenile dependency proceedings if domestic violence has resulted in abuse or neglect of a child, and in potential civil actions (e.g., for battery, wrongful death). For a discussion of the related issue of remedies for domestic violence in the family law context, turn to CEB’s Practice Under the California Family Code: Dissolution, Legal Separation, Nullity, chap 11.